Many existing footbridges built on urban waterfronts are clear examples of construction projects that can function an engineering solution to an existing problem (linking two sides of a river), and as an enhancement to the landscape of a city. 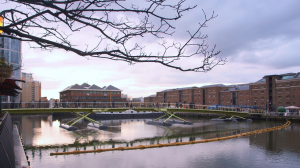 This paper seeks to analyse the role of contemporary footbridges in recent urban rehabilitation close to rivers. An historic approach to the role of the bridge in an urban context is therefore proposed. Moreover, it defines the main features concerned with degraded and rehabilitated waterfronts. It also outlines various reasons for emphasing the importance of footbridge construction in a degraded zone close to the inner city, using actual examples and published works on the topic. Our main conclusion is that footbridges play an essential role in uplifting degraded waterfronts, no matter how large the scale of the intervention. Description: Plasencia-Lozano, P. ( 2014 ). “Role of Footbridges in Waterfront Rehabilitation.” J. Bridge Eng. , 10.1061/(ASCE)BE.1943-5592.0000680.